Dale Russakoff’s The Prize – a chronicle of the education “reform” efforts in Newark, NJ that were supposed to be a model for the nation -- is as remarkable for what it doesn’t report as it is as for what it does. Russakoff, formerly a reporter for the Washington Post, tells the story of the effort to remake Newark’s schools following a highly publicized donation in 2011 from Facebook CEO Mark Zuckerberg. The $100 million gift (which was nearly doubled by matching grants) provides a catalyst for Newark’s Mayor, Cory Booker, and New Jersey Governor Chris Christie to implement a series of changes in the city that are often referred to as “corporate education reform”: charter school expansion, teacher merit pay, and the closing or reconstitution of “failing” schools. This trio, aided by NJ Education Commissioner Chris Cerf, take advantage of Newark’s status as a state-operated district to impose their agenda on the city’s schools. Confident that parental “choice” and promises of transformation will be enough to generate local support for their plans, they recruit a small army of consultants, pollsters, and advisers, all happy to get their share of Zuckerberg’s money. While Russkoff does a good job of documenting the political plays and backroom deals that follow from the donation, she does miss a few critical details. Cerf, for example, had led a consulting firm, Global Education Advisors, just prior to his appointment as commissioner by Christie. GEA was the firm that drafted the initial plan for transforming Newark into a “portfolio” district of both charter and district schools. At first, Cerf claimed that he was only minimally involved in drafting the blueprint; later, when confronted by the Star-Ledger (Newark’s hometown newspaper), he changed his story and admitted he had much more say than he originally let on. The potential conflict of interest, along with Cerf’s changing story, instantly called into question the credibility of GEA’s plan. Russakoff also fails to note that Newark already had a school reform plan in place: the Global Village, designed by prominent education scholar and activist Pedro Noguera. Based in part on the Harlem Children’s Zone, the plan called for increased community support and wrap-around services for students. Zuckerberg’s gift, however, changed the agenda in Newark, and the Global Village died on the vine. As Russakoff’s book progresses, two additional figures dominate the story. Ras Baraka – a city councilman, a high school principal, and eventually Booker’s replacement as mayor – emerges as the primary critic of the reforms. Baraka’s election becomes a de facto referendum on local control of the schools, which had been under state control for two decades. His decisive victory is widely seen as a rejection by the local community of the Booker-Christie-Zuckerberg plans. The other prominent player is Cami Anderson, recruited by Booker and Christie to serve as the State Superintendent. A bureaucrat with a reformer pedigree (Teach For America, New Leaders for New Schools, Joel Klein’s NYC-DOE), Anderson almost immediately alienates both the city’s leadership and the families whose students attend the public schools. Her autocratic style, tin ear, and penchant for disruption doom any chances of the community rallying around her plans. For those of us who closely follow New Jersey education policy, the story of Anderson’s subsequent travails is painfully familiar. Russakoff does a fine job documenting Anderson’s many missteps; however, I found her portrayal of Anderson as an early critic of charter school expansion awfully hard to swallow. The fact is that Anderson introduced her controversial “One Newark” universal enrollment system under the premise that children should have access to “great schools,” no matter if they were district or charter. It was only after her “Renew Schools” failed to produce the results she promised that she used charter schools as an excuse, claiming they were creaming off the most motivated students. Russakoff’s credulous acceptance of Anderson’s reluctance to expand charters actually betrays a larger problem with her book. The story is largely told through the interactions of the power players, interspersed with reports from two Newark schools: BRICK Avon, a district school, and SPARK Academy, an elementary school that is part of the national KIPP charter network. The stories from BRICK are the most compelling part of The Prize. Russakoff artfully details the struggles of the staff to overcome the effects of poverty on their students. There are small triumphs, but often followed by crushing setbacks. The story of Alif Beyah is particularly poignant: a standout basketball player who struggles in middle school, he makes great strides thanks to a relentless teacher, only to backslide when he enters high school. These portraits, however, are used to reinforce frameworks that reflect the views of the book’s powerful players – frameworks that Russakoff herself largely accepts with little challenge. Take school budgets: repeatedly, Russakoff states that charter schools are able to put more of their funds into the classroom, as opposed to the district schools, which are hampered by a large central bureaucracy. But data from the state’s Department of Education directly contradicts this claim. 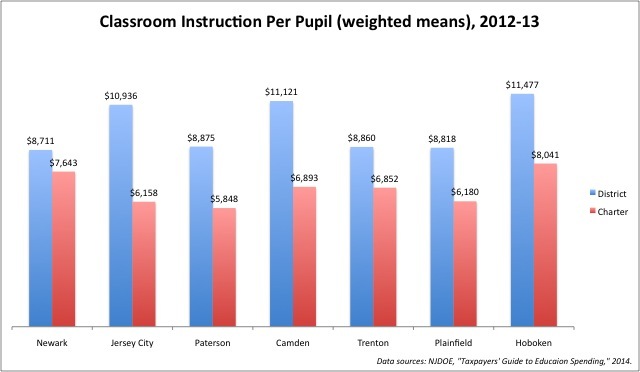 In my analysis of spending figures from 2012-13, I found district schools actually spend about one thousand dollars more on classroom instruction than their charter school neighbors. Further, Newark Public Schools only spent $1,757 per pupil on administration, compared to an average of $3,552 for the charters. That’s quite a bit of money that is not going into the classroom. In addition, NPS spends nearly $4,000 dollars more on student support services*, which includes guidance counselors, social workers, and child study teams. This actually makes sense: charter schools create redundancies in a system like Newark, as every charter is essentially its own district, requiring its own staff to manage its administrative needs. If we truly care about getting funds into the classroom, why create overlapping administrative systems that almost certainly will not be able to leverage economies of scale? Charters in large networks like KIPP often collect sizable private donations to help with these costs, which calls into question any claims of budgetary efficiency. They also don’t have to spend as much as NPS per child on support services because they educate fewer students with special education needs. Russakoff acknowledges these differences in student populations; however, she doesn’t dig deep into the question of how they might impact charter schools’ spending patterns, and whether those schools are truly more efficient with their budgets. She also bases her analysis of charter spending almost entirely on KIPP, even though its schools only educate about 20 percent of the students enrolled in Newark charters. In fact, the small, local charters that control the majority of the charter school market are barely mentioned throughout The Prize. KIPP is well-known for running a powerhouse public relations department; it appears that Russakoff relied heavily on them while ignoring the largest part of Newark’s charter sector. Another bit of received wisdom Russakoff doesn’t challenge is that Newark, like other urban districts, is plagued by unusually high numbers of ineffective teachers. Tenure and seniority rights keep these teachers in their jobs; if they could be removed, the district would see a rise in student achievement. Certainly, there is evidence that teachers in urban schools with high numbers of disadvantaged children are less likely to be highly-qualified. But affluent districts with high-performing schools have faculties with tenure and seniority rights; why are their schools “successful” if they are hindered by the same teacher protections? Further, where is any evidence that the teachers who would replace older “ineffective” teachers would be any better? Russakoff, like the lead players in her story, seems to believe that the ability to hire and fire teachers at will is one of the greatest advantages charters have over district schools because plenty of better new candidates would come into the system, even without any changes in working conditions or pay. Yet Newark’s charter teachers, according to my analysis of NJDOE data, are more likely to be white and are far less experienced than their NPS colleagues. Research tells us that racial alignment of teachers and students can play a positive role in student achievement; we also know that experience matters, as teachers on average grow in effectiveness well into their second decade. In shouldn’t surprise anyone then that, according to an analysis I wrote this past year, Newark’s “Renew” schools saw a sharp drop in growth measures after their first year. These schools reconstituted their staffs, leading to faculties with fewer black and fewer experienced teachers. If tenure and seniority are such an impediment, why didn’t the Renew schools succeed? The question challenges a foundational belief of “reformers”: that talent, more than systems reform and funding adequacy, is what leads to success. Zuckerberg himself chose Newark as the place for his experiment largely because he was impressed with Booker and Christie; like the managers he recruits for Facebook, they were the “great leaders” he was prepared to “invest” in. All of the power players in The Prize view teachers in the same way: getting “great” ones into Newark’s schools is the key to meaningful education reform. 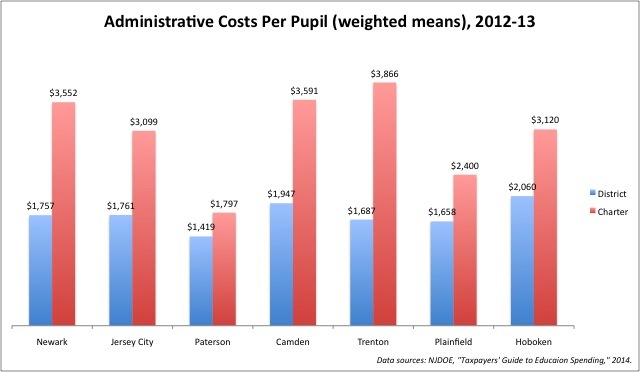 But no one, including Russakoff, ever stops to ask if there is any more than anecdotal evidence that Newark’s teachers are inordinately lousy given the amount the state is willing to spend on its school system. Give Russakoff credit for documenting how the political ambitions, ideological predilections, and, at times, sheer incompetence of the lead players in her tale kept them from meeting their goals. It’s a shame, however, that Russakoff didn’t go further and question some of the core orthodoxies of the reform movement. Had she taken this next step, The Prize could have been more than it is now: a well-written tale of politics with some compelling anecdotes of urban education included. Russakoff had the chance to use this story to break down some of the fundamental tenets of corporate-style education reform; instead, she embraces them with little to no challenge. Perhaps telling the behind-the-scenes story and unpacking the premises of the reformers is too much to ask from one book. But tales of power, while captivating, aren’t what we need right now; we’d benefit much more from an in-depth analysis of how “reform” is proceeding in our cities. While a worthy read, The Prize isn’t that analysis. 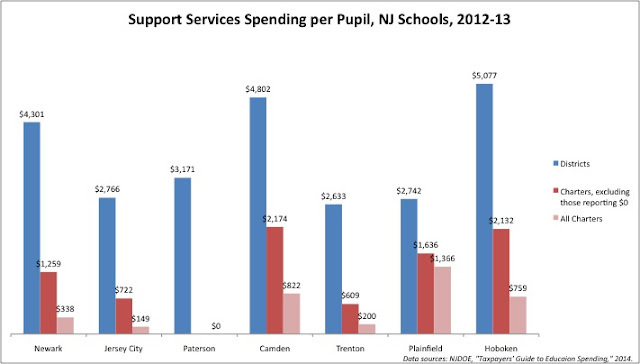 * Many charter schools in New Jersey report no spending on support services. It is possible they list spending for these services in other line items; therefore, to be as fair as possible, I calculated per pupil for all charters, and then again but only for those that report any spending on support. Quite so. I've always thought that the Newark "reform" efforts showed just why corporate donations will never solve public school programs. For one, a businessman would never take the $100 million and just spread it evenly over the entire community. He would pick the programs that are working and invest in those. Well, this won't work in a public program. Each citizen has to be treated equally. Secondly, there simply is not enough money, even from Mr Z and the like. Public program budgets are in the billions, not millions. No one has that kind of money. Public programs are not just some kind of failing private program; there is a valid reason for them. They solve problems that private programs cannot touch, such as crimes, fires, communicable diseases. These problems have a "public" aspect to them; the results of one person's activity affects others. There is no private solution to them; you have to involve everyone. Education is one of those progams. Global Education Advisors, just prior to his appointment as commissioner by Christie. GEA was the firm that drafted the initial plan for transforming Newark into a “portfolio” district of both charter and district schools. Thanks for your extremely thorough review. This book kind of gets what I call "squatter's rights". There simply isn't that many even attempting to be balanced accounts of the reform movement aimed at nonacademic audiences as opposed to PR from either side that Russakoff's book gets a boost for just being willing to try. I appreciate your challenges to her data. I'd add another criticism. There's no real bibliography and it's lightly footnoted. Russakoff is a good reporter who did some good reporting of the power players, but she's not really a data driven education researcher who can offer independent critique for a popular audience. Do you have any other recommendations for books that similarly attempt to drive a middle ground between reformers and the Ravitch wing that address some of the criticisms you mention?